If I told you I was going to recommend a funny 1951 movie about class differences, you would naturally expect something British. But this week’s film recommendation shows that post-war Americans too could also mine the comic possibilities of people from different economic strata rubbing shoulders: The Mating Season. The plot of this mistitled little gem: Ellen McNulty (Thelma Ritter) is a widow whose hamburger stand has gone bankrupt. She embarks on a long journey to visit her son Val, whom she and her hardworking husband were able to put through college. Val is a low level white collar manager (John Lund) trying to impress the big boss so that he can get ahead. After Val meets cute with the ravishing Maggie Carleton (Gene Tierney), daughter of a wealthy ambassador, the two fall in love and a wedding is quickly arranged, coincidentally on the day that Ellen is to arrive. Before you can say “screwball comedy” the young bride mistakes her dowdy, working class new mother-in-law for a maid, and the mother decides to play along, moving in to the new couple’s apartment! This is a film about how working class people can be both proud of their origins yet ashamed of them at the same time, particularly as conveyed through Lund’s character. Val both loves his mother and is embarrassed of her (His chemistry with Ritter is so natural it’s hard to believe they weren’t actually mother and son). Similarly, he both despises his rich, crummy boss yet also can’t resist the impulse to flatter and tug his forelock in front of him. The movie is also wise about how wealth makes some people generous and turns others into snobs. I don’t know if it was in the filmmaker’s minds or not, but it’s also intriguing to watch in terms of gender roles: Even though Val has little money and Maggie is rich, they both assume he will be the sole provider and the couple end up in debt as a result. But despite all that, this isn’t A Place in the Sun; the film’s accent is on laughs rather than dark drama and The Mating Season is delightful on those terms. Miriam Hopkins is hilariously over-dramatic as Tierney’s pampered and entitled mother, and Ritter, as she showed in so many other films (including prior RBC recommendation Pickup on South Street), can deliver a wisecrack out of the side of her mouth with the best of them. She was so good at being a character actor that Hollywood didn’t seem able to see her in any other light: Despite being the star here, she was nominated for a Best Supporting Actress Oscar. Roger Ebert used to point out how few Hollywood films take work and household budgets seriously. In the movies, single mom cocktail waitresses have huge apartments in Manhattan, architects are obligated only to look at a drafting board in their den in the evening rather than go into an office, and no one is ever shown paying their electric bill or doing their taxes. The Mating Season is a welcome exception to this rule, as Ellen works out how to deal with her failing hamburger stand, hitchhikes to save on travel expenses, scrambles for the money to pay her bills (including having to work for two days as an office temp for “Mr. Pinchbottom”), finds affordable-but-tatty lodgings and otherwise scrimps and saves. Throughout Ellen’s struggles, the film appropriately portrays as noble her and her husband’s ability to have afforded college for their son despite their modest means, rather than being condescending toward the aspirations that millions of post-war working class Americans shared. Director Mitchell Leisen was not a consistently strong artist, but he was good enough when, as here, he had a strong script from which to work. The Mating Season’s is by Walter Reisch, Richard Breen and Charles Brackett (Billy Wilder’s frequent collaborator). In addition to some memorable zingers, the trio’s script also has some funny 1950s style sexual innuendo. This team went on to win an Academy Award for screenwriting together two years later for Titanic, but they could just as deservedly won for The Mating Season. The Mating Season is American in style, but stands shoulder to shoulder with all the Ealing Studio comedies that alternated between having the audience laugh about class differences and nod their heads in recognition of the truths we so often don’t openly discuss. p.s. If you are an Amazon Prime subscriber, you can watch this film for free here. Yes, this is wonderful. I do think it can be hard to be the child of someone who is very successful conventionally. It seems to mess a lot of people up. I'm not sure if it's because of people making comparisons, or the parent being absent a lot, or what. Just saying. I wish I could recall the citation, but I remember reading a study in graduate school of paternal interaction with kids, and I expected that the professional class dads would have the most and I was wrong — blue collar dads spent much more time with their children than lawyers/doctors/architects/engineers etc. I see that confirmed now among a (very sad) group of professors in their 60s-80s who ignored their families for decades and are now shocked that their kids and grandkids go to visit their ex-wives at the holidays rather than them. Keith: the grandkids have ex-wives? Only in California. "Roger Ebert used to point out how few Hollywood films take work and household budgets seriously." This also holds for TV. The typical Brazilian telenovela is set in a rich family in São Paulo or Rio. The plot is built out of complicated struggles over love, power and money. So far, so true to the home life of the patrimonial firm (think of the Murdochs). But we don't see where the money comes from. In the last telenovela I followed, the firm was in construction. But we never got even a stock shot of a drafting office or construction site. Bribery, yes. Two of the most popular programs in U.K. in the 1980s were Dallas and Dynasty, soaps about the American super-rich. Yet the most popular British-produced soaps (Coronation Street, East Enders) were working class, kitchen sink dramas. British working-class soaps don't cover work either. The characters rarely get fired, go on strike, fight with the boss, or argue with officials about benefits. The only shows that cover work relationships in any depth are set in hospitals and police stations. Strange. You never watched Brookside, I take it. Weirdly, I tend to adore police procedurals and be bored to death by medical shows. And I notice one thing they have in common is that whenever it gets boring, you just have a crime or a car accident happen. So for the writers it's easy to have fake momentum. I watched this last night and I have a slightly different take on it then the reviewer. a) I didn't come away thinking that Val was embarrassed about his origins so much as thinking that others (esp. his boss, less so his wife)would think less of him for them and that would interfere with his ambitions. It was more a pragmatic evaluation of his situation. In addition, I don't think he was ever embarrassed about his mother. The whole cook/servant subterfuge was her idea to help out once the initial misunderstanding occurred and she refused to let him straighten it out. b) His wife was not rich, although she had been raised rich. Judging from the way her mother lived, some wealth must have remained in the family, but it appeared that none was available to Maggie unless she wanted to live under her mother's thumb. c) I think the reference to Val's tugging on his forelock is anachronistic in so many ways. My impression of 50s corporate hierachies is that they were much stricter socially than we are now accustomed to, and Val had to show a certain amount of deference just to hang on to that career. White collar jobs provided some economic security, certainly relative to blue collar jobs, but they did not allow for much freedom as we now understand it. Everything I've ever read about IBM in its heyday, or Ford or GM, is consistent with this: "We'll take care of you, if you do as you are told." I imagine that smaller mfg firms in small cities of the midwest would reflect the same structure and expecations. 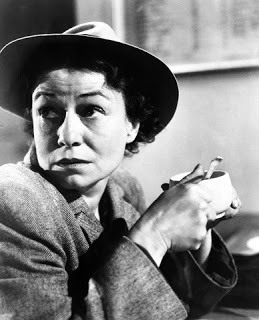 And Thelma Ritter is excellent, and (as the role calls for) Miriam Hopkins is dreadful.